THE FOLLOWING CHECKLISTS ARE SUGGESTED ITEMS TO PACK. THESE LISTS ARE NOT EXHAUSTIVE. AMEND AS NEEDED. INCREASED BAGGAGE USUALLY = DECREASED FUN! [_] Small Flashlight w/ New Batt. [_] Note: If your group is doing construction then pack work clothes (work pants, T-shirt, & gloves) and work shoes/boots. [_] Note: If your group is white water rafting then each rafter must wear shoes or sandals with ankle straps. Bring proper amount of activity clothes that are lightweight & quick drying. Pack according to weather forecast. [_] Note: If you are participating in a swamp hike then your shoes will get trashed (wet, muddy, scratched, etc). It's a good idea to bring a pair of old tennis shoes that you can dispose of after the trip. [_] Note: The more weight you carry the less fun you will have. Try to only bring what you need. 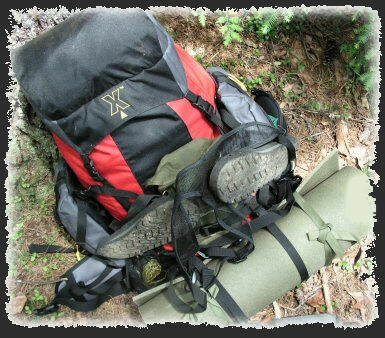 Luxury items may seem like a good idea until the 2nd mile of your hike. ATTENTION! Due to sharp rocks & oyster shells around the island, participants are required to wear tennis shoes while in the water!!! Portable toilets will be available. WARNING: During an adventure race your team decides on the route you will take from checkpoint to checkpoint. Palmetto trees, briars, barbed wire, etc may cause scratched skin on exposed body parts. Some participants choose to wear activity pants for this reason. WARNING: Encounters with wild animal are possible. WARNING: Spring fed water temperatures average 72º F year round. Inner tubing duration on Rainbow River & Weeki Wachee River is approx 4 hours. Extended exposure to cold water may result in hypothermia especially for smaller children & those with very low body fat. Also, there is very little shade along the river so bring plenty of sunscreen to prevent sunburns. RAINBOW RIVER NOTE: NO DISPOSABLE ITEMS ARE ALLOWED ON RAINBOW RIVER! That means you can NOT bring anything on the river that is designed to be thrown away after use (such as an Aquafina water bottle, zip lock bags, sandwich bags, soda cans, candy bar wrappers, etc). All food items MUST be taken out of their disposable wrappers & placed in NON-DISPOSABLE containers (such as Tupperware, thermoses, non-disposable water bottles, etc). This law is strictly enforced by law enforcement officers. Coolers are allowed. If you have any questions you can call the KP Hole county park officials at: 352.489.3055. WEEKIE WACHEE RIVER NOTE: There is an approx 20 minute hike through a pineland forest in order to get to the river. You will have to carry your tube & supplies for approx 1.5 miles. The sand along this trail gets VERY HOT. Sandals or flip flops are mandatory for the hike. WARNING: Clothing will get filthy while caving. WARNING: Clothing will get messy while playing paintball. Thicker clothes soften the impact.